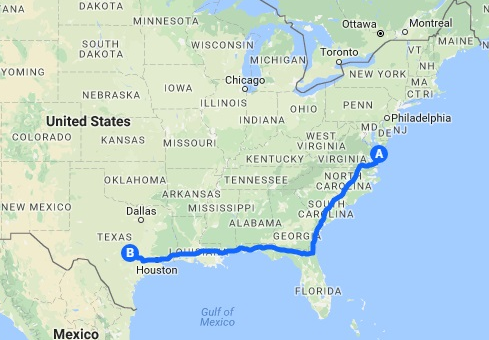 At the end of this month, I’ll be driving to Austin, Texas and back, making the first couple of Dirty Digital Jobs visits. I’m awfully sick of winter so my plan is to take the southern route along the panhandle of Florida and the Gulf Coast on the way there–the warm weather will be a welcome change!. I’ve only got a couple of days to get to Austin in time for Wayne Locke’s ShopBot User Group taking place March 3-4 so it will be a pretty hard push, but I already have visits scheduled with longtime ShopBotter and musical instrument maker, David Beede, woodworker Tim Lucas, and sculptor Kevin Gallup. If the timing works out, I’ve got a couple more stops that I want to make on the way there and will keep my fingers crossed that I can make them happen. I’ll post about my visits on the ShopBot blog as I go, so keep your eye out for updates. Wayne has been hosting ShopBot events longer than anyone, but I’ve never had a chance to go to it before, so I’m really looking forward to seeing old Texas friends and learning some new tricks. For a couple of days afterwards I’ll be visiting shops around Austin, including the amazing Techshop in Round Rock that’s connected to a Lowe’s. If you’re in Austin and looking for cheap labor for a couple of hours, let me know and I’ll try to fit you in. At the end of the week we’ll be setting up for SXSW Create taking place March 10-12, where my son will meet me for the trip home. I’ve always wanted to visit PieLab in Greensboro, Alabama and re-visit Rural Studio and the $20k House project, so we may try to take a jog up that way on the way home. Whichever way I go, I’ll be looking for more Dirty Digital Jobs to do, so if you’re generally between Austin, Texas and the Eastern Shore of Virginia, drop me a line at info@shopbottools.com and we’ll see what we can work out. And most importantly, keep the coffee pot on!